Guard your birds against disease by applying these essential tips. A flock of healthy, happy ducks is a joy to behold: tails a-wagging, they greet the day with enthusiasm — cavorting in their swimming pool, preening their glossy plumage and searching bright-eyed through the grass for delicious bugs. When your animals are the picture of good health, life on the farm feels right. For those of us who have become completely enamored with our little flocks, that feeling of well-being changes drastically when a duck falls ill. You notice one morning that Daisy doesn’t come speed-waddling over for breakfast with her companions. Instead, she sits in the back of the house looking listless, feathers ruffled. Suddenly, it seems as if a black cloud has blocked out the sun. How sick is she? What’s wrong with her? Will the rest of the flock catch whatever she has? Happily, waterfowl tend to be hale and hearty creatures when given proper care. But even the most conscientious management won’t guarantee that your birds will never get sick or injured. In this article, we’ll look at proper ways to handle ducks in sickness and in health. We’ll also cover basic information on some of the health problems your flock can experience. Let’s begin our discussion of flock health with an important question: How do you prevent illness and injury from ruining your ducks’ day — and yours — in the first place? Let’s look at some savvy strategies for minimizing problems. Start with healthy stock from a reputable source. Whether you start your flock with ducklings or adults, obtain your birds from a good source that carries healthy stock. 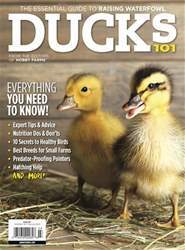 If you are picking out the ducks yourself — at a feed store or a farm, for example — choose ducks and ducklings that appear vigorous and active. Avoid those with pasty rears, discharge from the eyes, or leg problems as well as any listless-looking birds that just sit around with their eyes closed all the time. Feeding your birds a healthy, balanced diet with ample fresh water is critical. 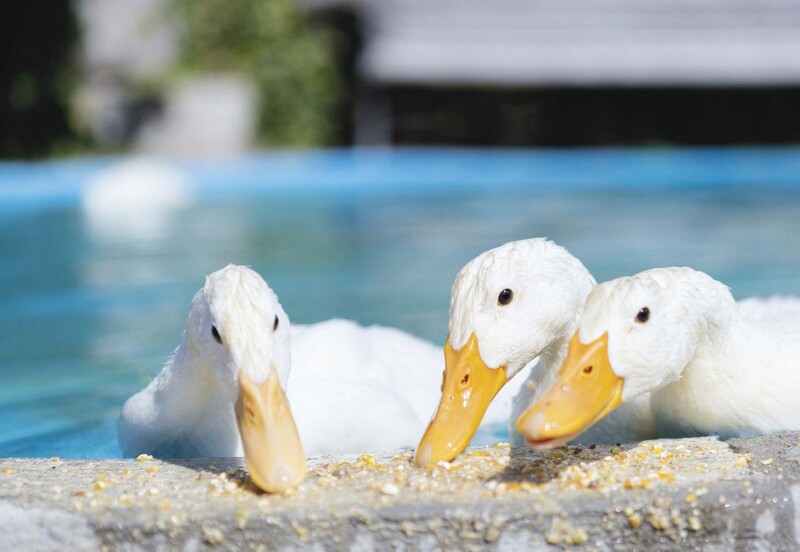 An inappropriate or unbalanced diet ranks as one of the leading causes of health problems in domestic ducks. Ducks can’t thrive on a diet of bread alone — or corn or lettuce or grass — any more than we can. Overdoses, deficiencies and imbalances of specific nutrients can be bad news for your flocks’ health. Waterfowl also require an abundant supply of clean drinking water to remain healthy. With ducks’ dabbling and bathing habits, keeping their water sparkling clear all the time is impossible, but do change it at least once or twice a day, and scrub the containers regularly to keep the water from turning foul and stagnant. Avoid crowding your ducks. Ducks are social animals, but they don’t enjoy being packed like sardines. Overcrowding causes filthy conditions, promotes the spread of disease, and increases aggression and stress. So ditch the factory-farm mentality, and give your ducks plenty of space to breathe, bathe, eat, preen, interact and basically behave like ducks.